Meet the Veterinarians & Team of Coffee Road Animal Hospital in Bakersfield! We’re pleased to provide exceptional vet care for your pets! Please call us at (661) 587-1976 to speak to one of our caring veterinary staff members! Dr. Craig Hammans, owner of the Coffee Road Animal Hospital, graduated from Oklahoma State University with a degree in Veterinary Medicine in 1987. Upon graduation, he came to Bakersfield where he started working at Southwest Veterinary Hospital. After four years at Southwest, he founded Coffee Road Animal Hospital in 1991. The Hospital became incorporated in 2001 and the Coffee Road Pet Resort was added. Coffee Road Animal Hospital and Dr. Hammans have been recognized by The Bakersfield Californian as “The Favorite Veterinarian and Pet Hospital” as well as “The Best of Bakersfield Veterinarians and Pet Hospitals” in Bakersfield. Dr. Hammans and his wife, Mary Kay, have two sons, Tristan and Colton. Outside of the Hospital, Dr. Hammans enjoys traveling, woodworking, fishing, photography and watching his sons’ sporting events. He and his family like spending time playing with their pets, their two chocolate labs named Cooper and Truman, and their cat, Kit Kat. Dr. Mischke is a graduate of Colorado State University where she received her Bachelor of Science degree in Veterinary Science. She received her Doctorate of Veterinary Science degree from Colorado State University’s College of Veterinary Medicine and Biomedical Sciences. Dr Mischke joined Coffee Road Animal Hospital in 1995 and serves as an associate veterinarian as well as the hospital’s medical director. Dr Mischke has wanted to become a veterinarian her entire life. She brings her love of animals and her passion for the science and art of medicine to her work at Coffee road as evidenced by her compassionate and caring approach to all of our clients’ pets. While away from the hospital, Dr Mischke cares for a sizable “herd” of her own pets – dogs, cats, horses and chickens. Dr Mischke enjoys visiting family, outdoor activities and training and competing with her dogs. 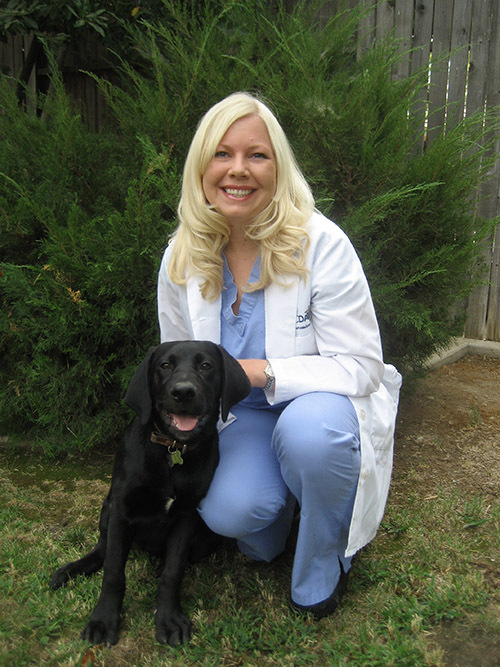 Dr. Paine graduated from the University of California Davis with a Doctorate of Veterinary Medicine in 2006. She also holds a Bachelor’s degree in Biological Sciences from the University of California Santa Barbara. Dr. Paine is a Bakersfield native who joined the Coffee Road Animal Hospital medical team in 2006. She is an invaluable member of our veterinary staff who provides excellent care to family pets. Outside of the Hospital, Dr. Paine enjoys traveling, reading, and visiting with her family. She and her husband, Scott, enjoy playing with their pets, which include, a cat named Maia, and a black Labrador retriever, named Hali. Dr. Michel knew as a toddler that she wanted to be an animal doctor as she would surround herself with stuffed animals and carefully treat all their imaginary ailments. As she got a little older she would enlist any family member or friend to bring their animal into “her office” where the examination, shots, and surgery would all take place in moments and happy healing pets would always exit. There was never any question in her parents’ mind where her passions lied and that she would become a veterinarian one day. Dr. Michel’s passion is general internal medicine and surgery, she loves the daily interactions and challenges of general practice. Her clients and their four-legged family members well being are what drives her enthusiasm for the profession. Dr. Michel has been a practicing veterinarian in Bakersfield for almost 30 years, she joined Coffee Road Animal Hospital in February of 2001. She received her bachelors of science in animal science from Cornell University in New York in 1983, and went on to do research at the College of Veterinary Medicine at Cornell in the department of pharmacology for 2 years. She then returned to college and received her Doctorate of Veterinary Medicine from Cornell and graduated in 1989. Dr. Michel moved to California after graduation in search of warmer weather, landed in Bakersfield, and set down roots. When not caring for pets at the office she is caring for her family (including all her fur babies). She enjoys doing crafts, reading, and hiking. 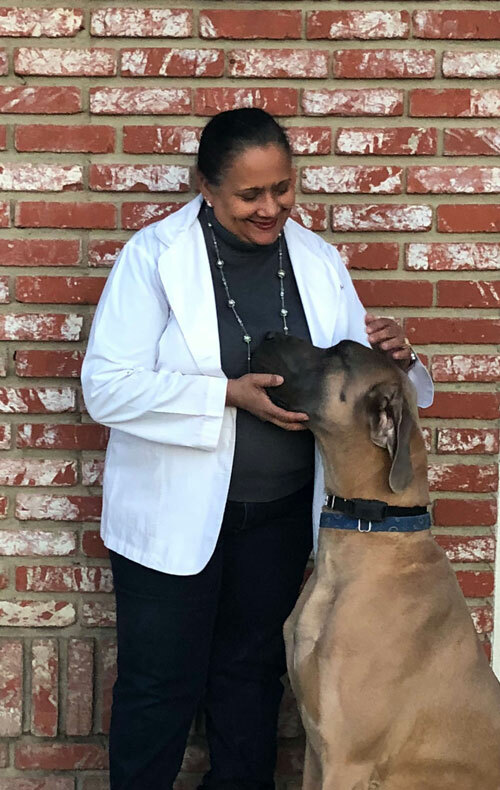 One thing that might surprise you about Dr. Michel is that she has had Great Danes for over 40 years.